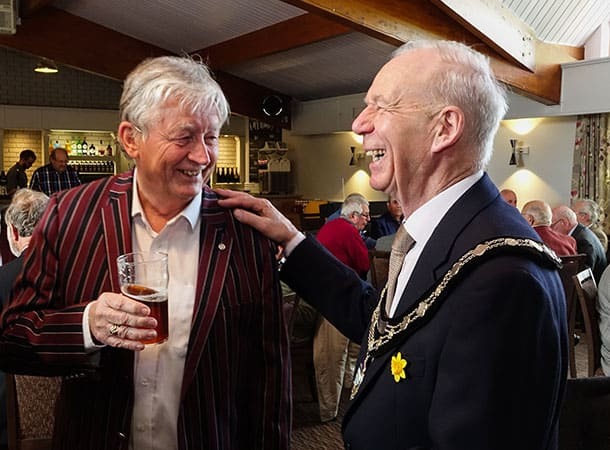 It commenced with morning coffees, a bit of general admin, and the arrival of the guest, Malcolm Connolly, the Mayor of Fordingbridge, accompanied by the Chairman, Derek Ayling. 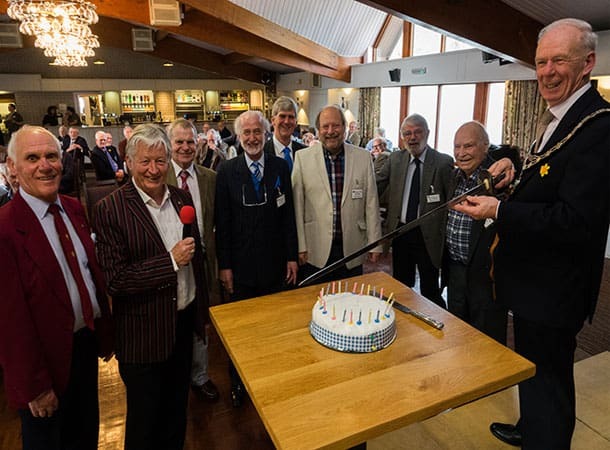 The “93 Club” is a non-profit-making Gentlemen’s luncheon club, based in Godshill, Hampshire, that meets every third Thursday of the month for a talk by an informative speaker, followed by a very pleasant lunch with good, interesting, entertaining company. The club was founded in 1993: hence the name, and hence the 25th anniversary celebrations. The formal proceedings commenced with a “brief history of time”, mainly consisting of an explanation by Foster Herd, one of the founder members, of how it all started. It was extremely interesting and Foster explained some facts that much of the membership was not aware of. Foster did the Club proud! Four new members were introduced to the club, and then the speaker of the day, Pip Martin, gave us an hour’s talk on the joys and benefits of being a rural curate and vicar. He included some lovely locally-based anecdotes. After the excellent lunch main course, the tables were cleared, in order to avoid clutter during the Mayor’s address. The cutting of the cake took place immediately afterwards. The event was closed by Derek Ayling, Chairman, who thanked the Committee, Foster Herd, Alan Dudley and his team, for the planning, the displays, and the photograph albums, and indeed, Bill Shepley, the photographer! Derek then proposed a toast to the next 25 years.